If you're like me you likely look at supplements (especially those for exercise performance) VERY cautiously. As in, I almost always roll my eyes when people start asking me about the new magical pill or powder that their friend is selling. At Momsanity we advocate real food. We also advocate understanding your body and its deficiencies and supplementing accordingly (with the help of an integratively minded physician). We also value research. And I mean research that isn't funded by the company promoting the product. 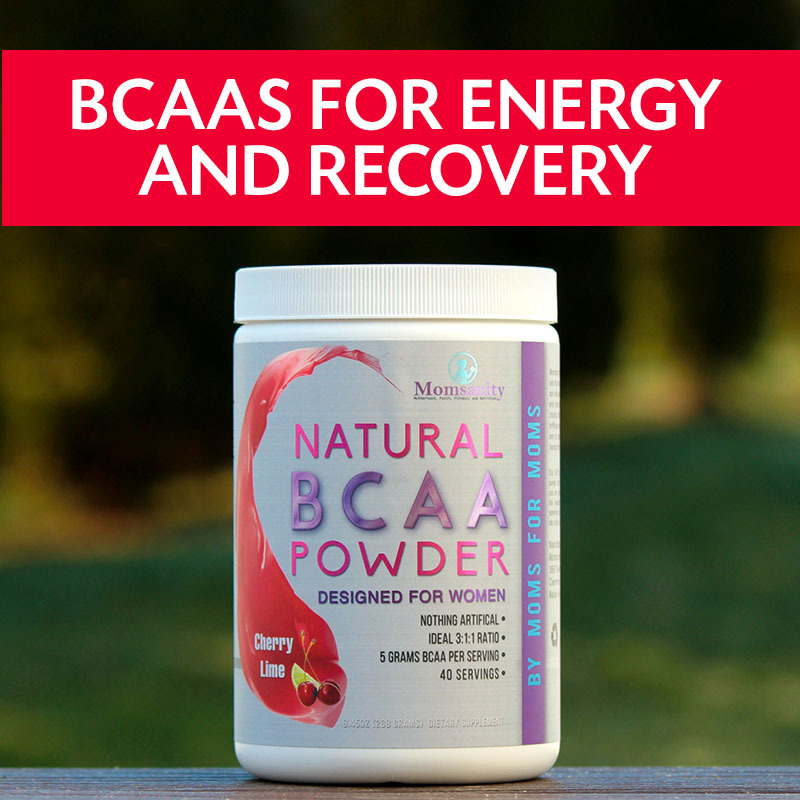 Years ago when someone suggested I try taking BCAAs to enhance my workouts, aid in my recovery and help me with my afternoon energy I was a skeptic. BUT I consulted the research and I was blown away with what I found. BCAAs are NOT just for body builders. They have SO many well-researched benefits! During this series we want to break down the power of BCAAs into bite sized chunks. Today I'm going to share JUST about exercise,energy and recovery. Next week we'll talk more about hunger and cravings and then a few FAQs. If you have questions you would like for us to answer in the FAQ email please respond back and let us know! 1. BCAAs improve protein synthesis: What that means is that BCAAs support muscle growth (a GREAT thing) during exercise AND help us maintain lean mass during periods of rest and recovery. 2. BCAAs help us maintain muscle as we age: Our bodies begin losing muscle mass around age 35. When we lose muscle mass it negatively affects our metabolism. BCAAs help fight that breakdown. 3. BCAAs fight post workout fatigue: MANY studies show that BCAAs promote hormonal balance that fights fatigue. 5. BCAAs block "tired" hormones: BCAAs block tryptophan from going to the brain which means less serotonin telling your body it's nap time. 6. BCAAs decrease muscle soreness and preserve muscle fibers making more frequent intense exercise possible. 7. Scientists are confident that those with higher BCAA levels live longer and enjoy better cardiovascular health. NOW I know you've seen lots of articles about how all supplements ARE NOT created equally. Most companies want to make products as cheaply as possible to maximize return. Of course all businesses want to make money, but when we set out to develop our Momsanity BCAAs our two primary goals were 1. to produce a clean and quality supplement free of artificial ingredients and 2. to create the best tasting products possible. We don't cut corners. We make a lot of demands of our manufacturer. We stand behind our commitment to you. You can find our multiple flavors of BCAAS (think Cherry Lime and Raspberry Lemonade and Fruit Punch and More...) HERE. All orders ship FREE!